Friday night is Family game night and this first Friday of February Finnegan took us through the second scenario in his narrative campaign for Sentinels of the Multiverse. In the last game, we defended the Freedom tower from Ambuscade. Having defeated him, we discovered he had attacked the building at the behest of Baron Blade who wanted him to try and steal some piece of technology that Baron Blade wanted to use for some nefarious purpose. And so it was decided we must go and put a stop to Baron Blade, but to do that we would have to travel to space…. But how to do that? Well, apparently, the Maerynians have a few laying around, so we travelled to the Maerynian Refuge to see if we could borrow one… but when we got there AKASH’BUTA showed up and wreaked havoc upon the island… we had to put a stop to that! And put a stop to it we did! We were a little concerned when Finnegan put out the villain card and it had TWO HUNDRED hit points on it!? Yowza! 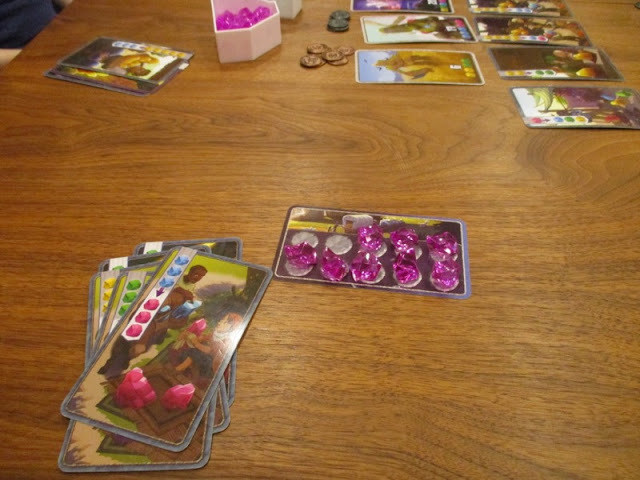 But it turned out to be not so bad because each time we destroyed one of the cards she put into play, it did a pile of damage to her… I ended the game by doing a colossal TWENTY-NINE damage – in one turn – to finish off AKASH’BUTA! Saturday evening is role-playing night, and this week Amanda and headed over to our friends’ place to play Call of Cthulhu, while the kids friends came over to our place to play Dungeon Crawl Classics. 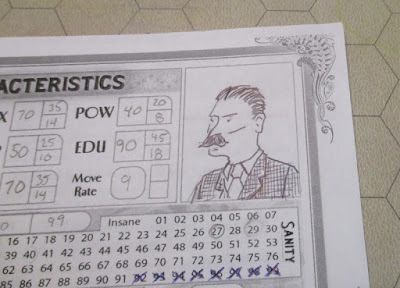 In the Call of Cthulhu game I am playing George Patrick Fitzgibbon - a professor of Geology at Miskatonic University in Arkham Massachusetts. He is originally from England and served in the Tunneling Companies during the Great War. Amanda is playing Ethel Rigby, who is actually a character she played in the previous campaign (Masks of Nyarlathotep). 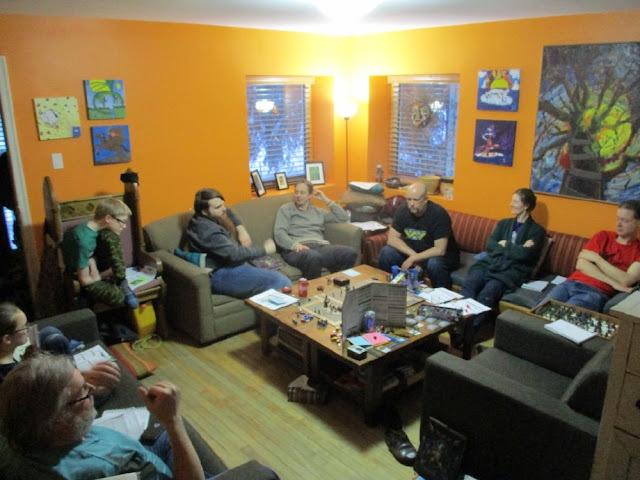 This was the first real adventure of the campaign… and it was very nearly a total party kill at the first encounter and we totally failed to succeed in the mission. I’m not sure where we’re going from here. As it turns out I’ll be missing the next two sessons – the first because of my annual Winter Wargaming Weekend and the second because of the Battle of the Abyss – team Apocalypse event at the beginning of March. Sunday evening is supposed to be our OTHER Family Game Night. As I originally planned to have a little “Apocalypse Practice’ with my team mate, we instead decided to play a game in the early afternoon. 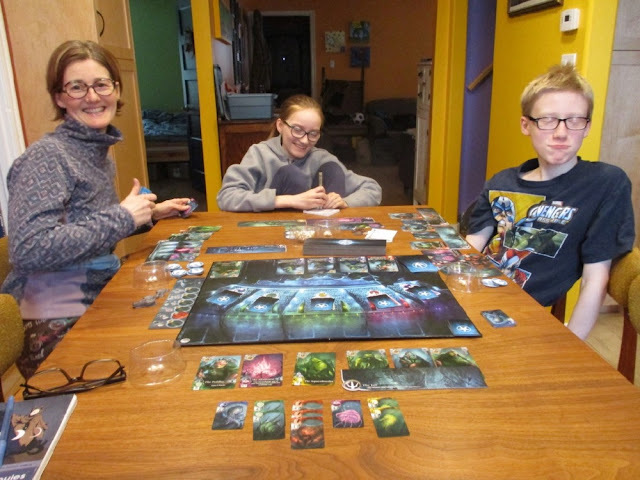 It has been a while (over a year) since we played Abyss – so The Girl briefly went over the rules with us beforehand. It took a bit for me to remember what was going on. 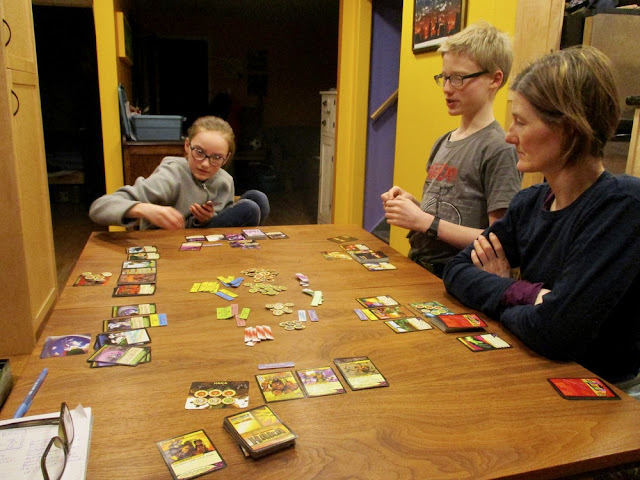 I like the game – there are a number of different ways to gain influence (the player with the most influence at the end of the game wins) and you really need to pay attention to all of them – and manage and play your allies cards to gain as much as you can from them. 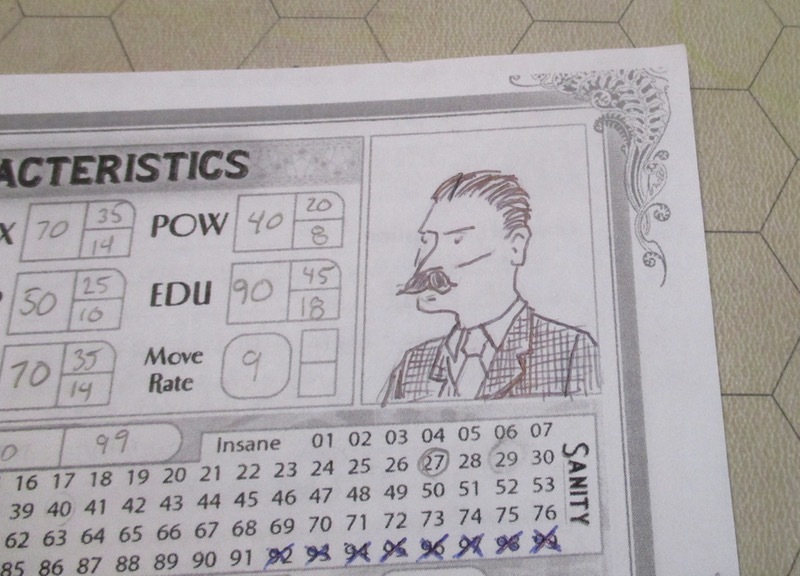 Amanda ended the game, but it was Finnegan that won – with 82 influence. Amanda was right behind him with 80. I didn’t do TOO badly with 73. The Girl was a bit grumpy to end up with 50 – when the rest of us being so close together. We were constantly, inadvertently, foiling her every move throughout the game – or at least is seemed like it. Later, my Apocalypse partner bailed – being too exhausted from a busy week to leave his house (it was also really, really cold and snowy out – I wouldn’t have blamed ANYONE for not wanting to leave their house this week). So we ended up playing a second game! But the round is finished before the game ends and, on my turn, I picked up a jewel card worth 5 points, which also allowed me to pick up another patron tile worth 3 more – rocketing me into first place with 17 points! 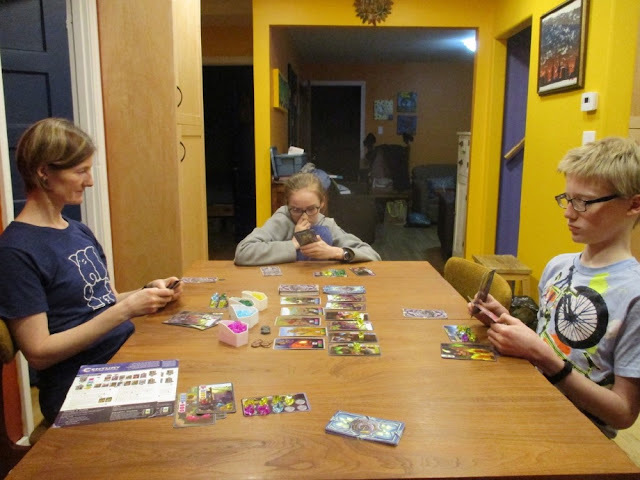 The Girl was again terribly disappointed with this outcome as she ended with 14 points and had she had another turn would have picked up another scoring card. 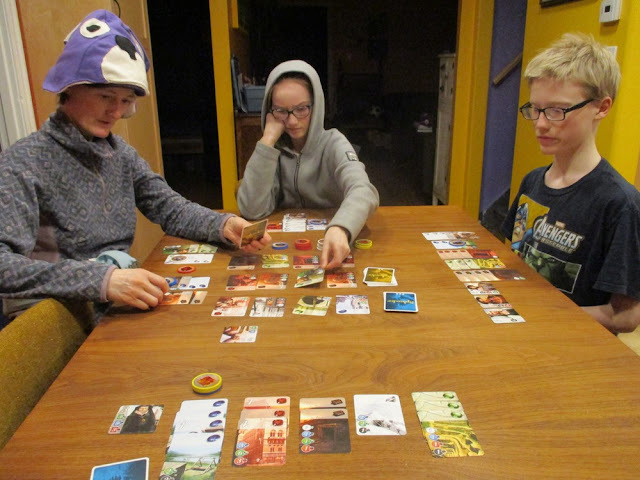 She has yet to win a game of splendor and was so very close with this game… Amanda wasn’t far behind at 11 points, I’m sure given another turn she would have managed to get 15+ as well…. In the afternoon, I stopped by Dragons Den Games and picked up a few things – a Fiend of Slaanesh and Khymerae (which I have since painted) as well as a couple of expansions for Terraforming mars (Venus Next and the Hellas and Elysium board). 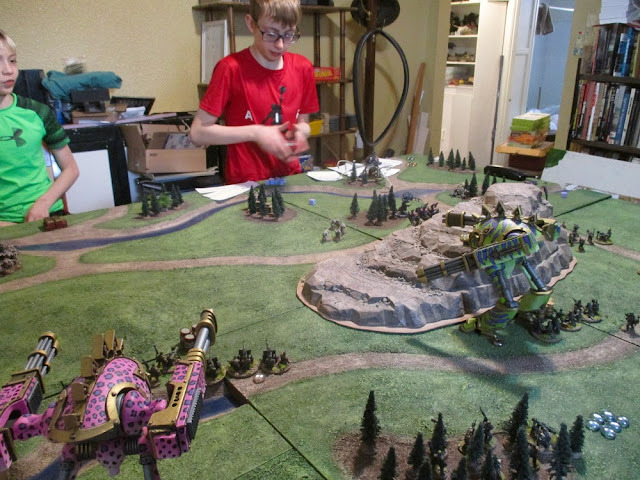 Later in the evening, I kicked off the Saturday Evening Wrath & glory campaign. Three guys from the Hunters of the Warp – the local 40K League – joined Finnegan and I, and I ran them through the first adventure in the Darks Tides book. I played Phobolog. 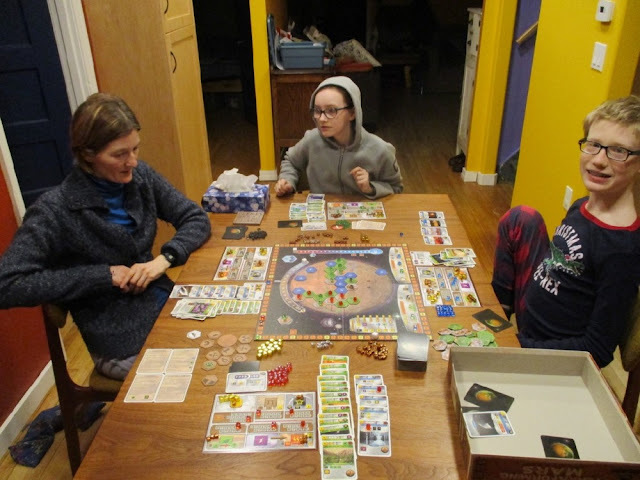 Amanda played Interplanetary Cinematic. The Girl played Saturn Systems. Finnegan played Thorgate. I think this was the first time we used Thorgate. Finnegan came up with a corporate tag-line "FEEL THE THUNDER!" which he used a few times throughout the game. It felt like this game went very quickly. Like, TOO quickly. Like I was just starting to get into my stride, and BOOM the game was over!? 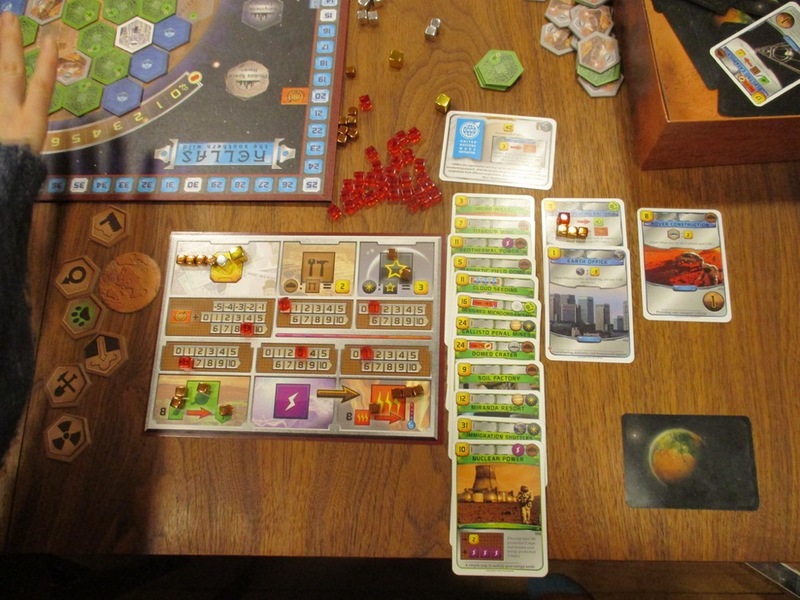 Finnegan won the Science and Thermalist Awards and took the Terraformer milestone. I came in second on the Science and Thermalist Awards. Amanda took the Builder milestone and was second for the Banker award. 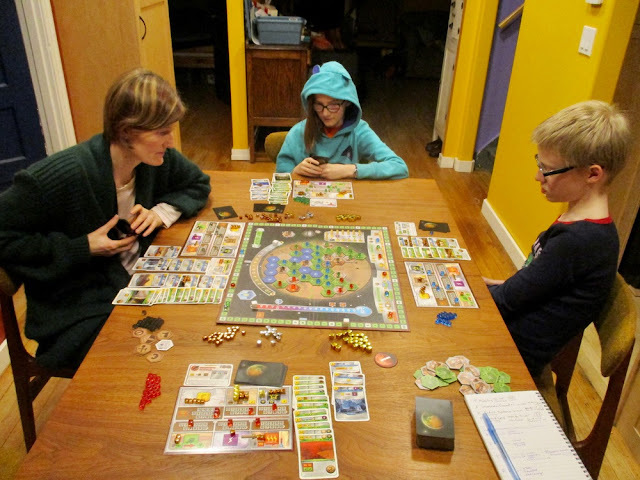 The Girl won the Banker award, tied with me for second on the Scientist Award and took the Mayor Milestone. Amanda was the only one that made use of cards that took stuff from other players knocking off piles of my leaves and a few of Keira's, three of my titanium, one of The Girl's titanuium production and... I think some money of Finnegan's...? The final scores were all very close – The Girl won with 61, Finnegan was just behind her with 57, and Amanda and I tied for last at 55. 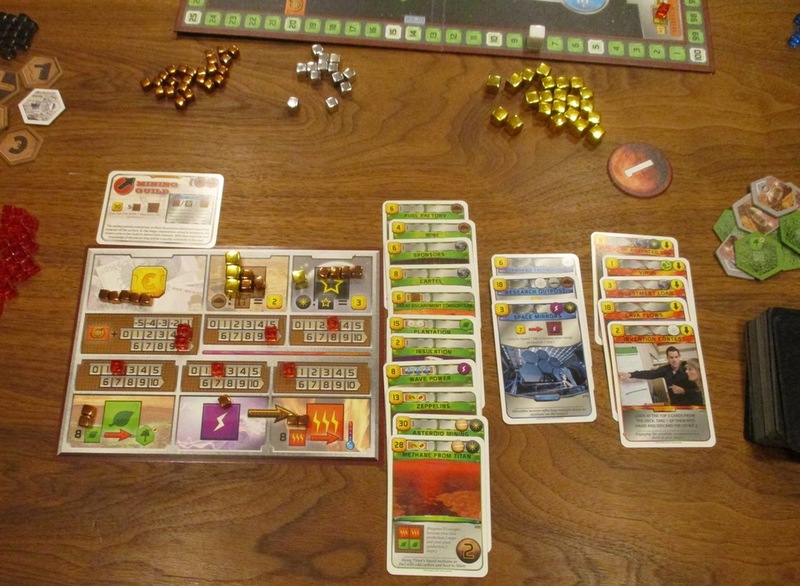 Monday Amanda and I skipped our Ballroom dance class – mostly because Amanda was just too tired to go out and dance – but not too tired to play Terraforming Mars again. 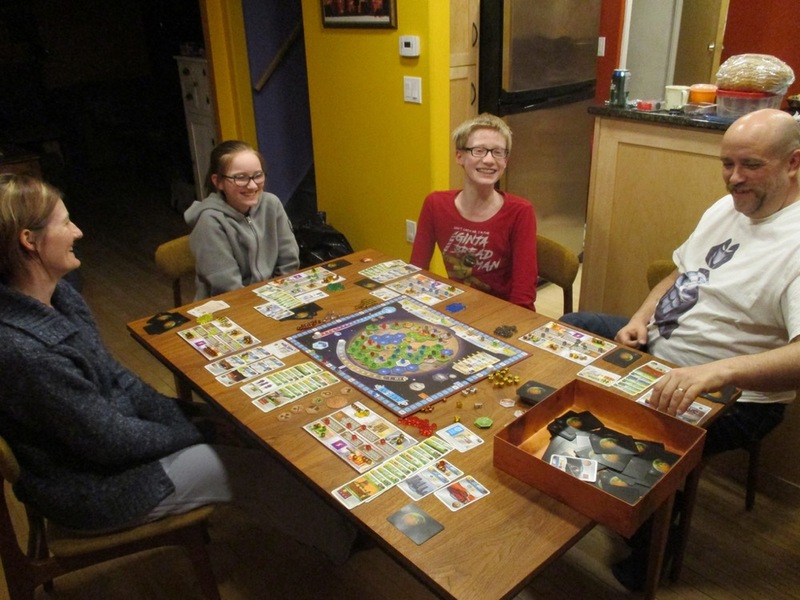 She had said we should play with the base game a few more times before adding any expansions, but when the girl and I set up the game, we went ahead and set it up with the new Elysium board. Amanda was a bit cranky that we had done so at first, but warmed up to the new play. It was really interesting how different play was- how you had to think about totally different things when all the milestones and awards are different! I tried out the Mining Guild – which was really fun. The Girl played Terator and Amanda played Helion. Finnegan just rocked Ecoline! He won the game with 83 points – the rest of us were back in the 60s! Ecoline had done really well both times it’s been played. After the gaming weekend activities wrapped up, Paul stuck around and had supper with us and then played a game of Terraforming Mars. This was Paul’s first time playing it. 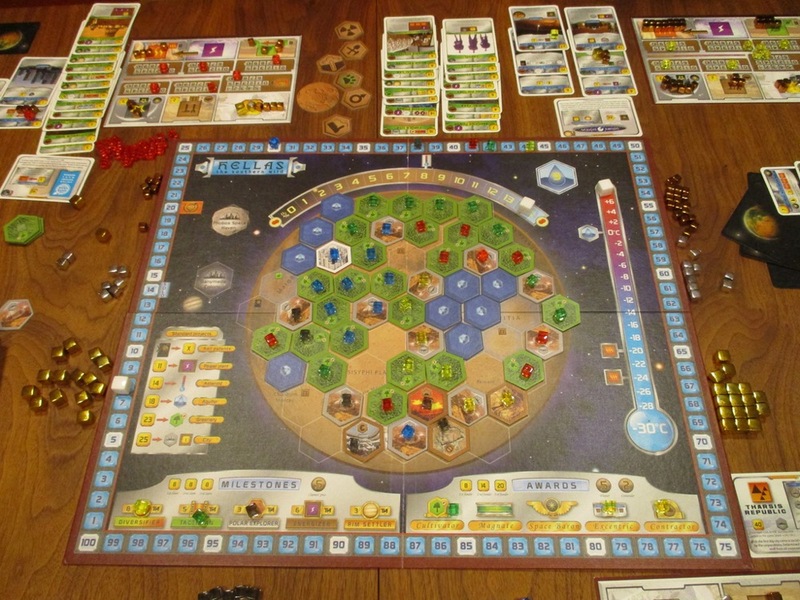 This time we tried out the Hellas board. 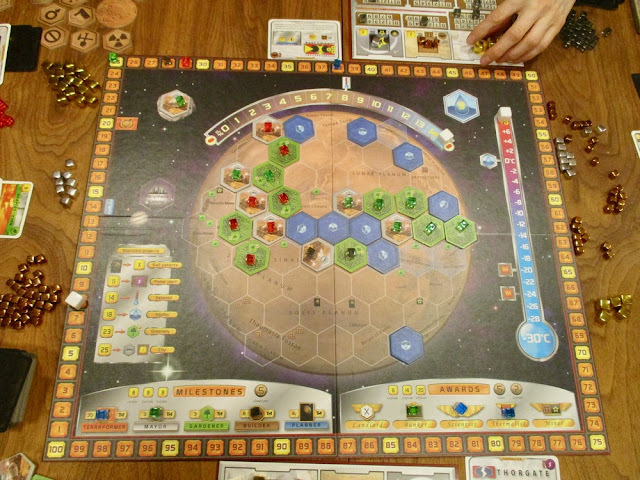 Finnegan played the Tharsis Republic. Paul played Helion. 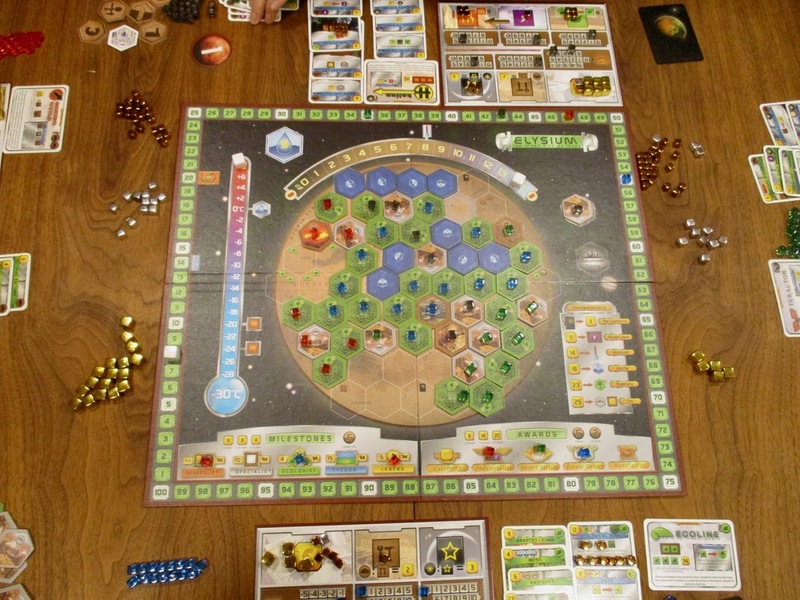 I played the UN Mars Initiative, which was interesting. Amanda played Saturn Systems. The Girl played Inventrix. Paul got the Polar Explorer Milestone. I was second for both the Cultivator and Contractor awards. Amanda took the Diversifier milestone and was first for both the Eccentric and Contractor awards. Keira got the Tactical Milestone and was first for the Cultivator Award and second for the Eccentric. Amanda and The Girl ended up TIED with 65. Amanda ended up winning as she had over 70 Megacredits, and The Girl had only 40… I was just behind both of them with 64. 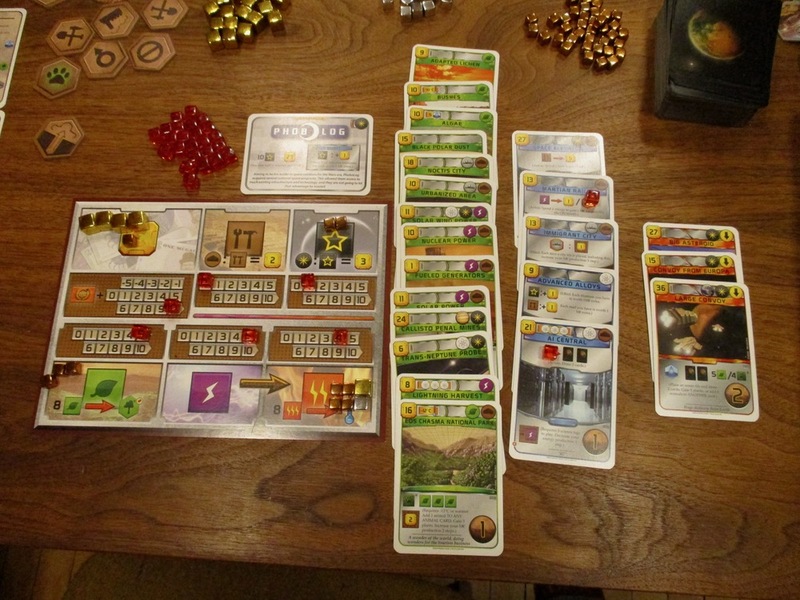 Finnegan wasn’t too far behind with 57 – it was nice to see Tharsis Republic NOT win, for once (it’s done exceedingly well the other two times someone’s played it!). Paul was just behind Finnegan at 52 – which is pretty good for a first game! 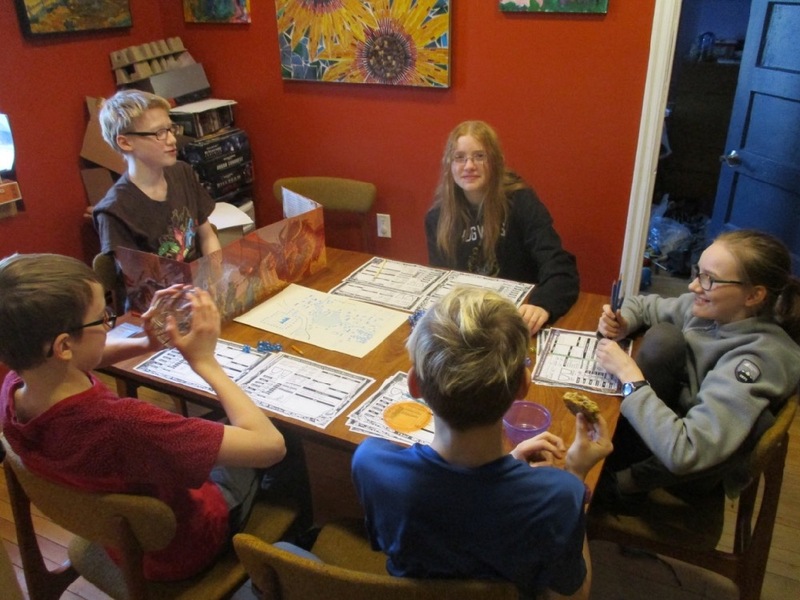 Monday was Family Day in Saskatchewan – a Provincial Stat Holiday. It also kicked off a week-long school break. 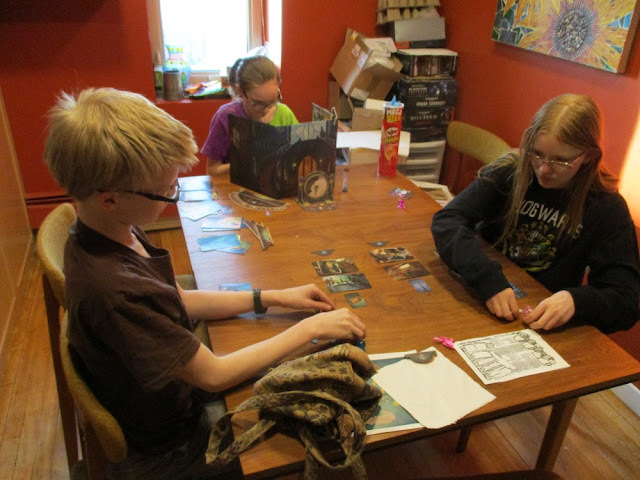 The kids arranged to get together with friends and play games most of the week. 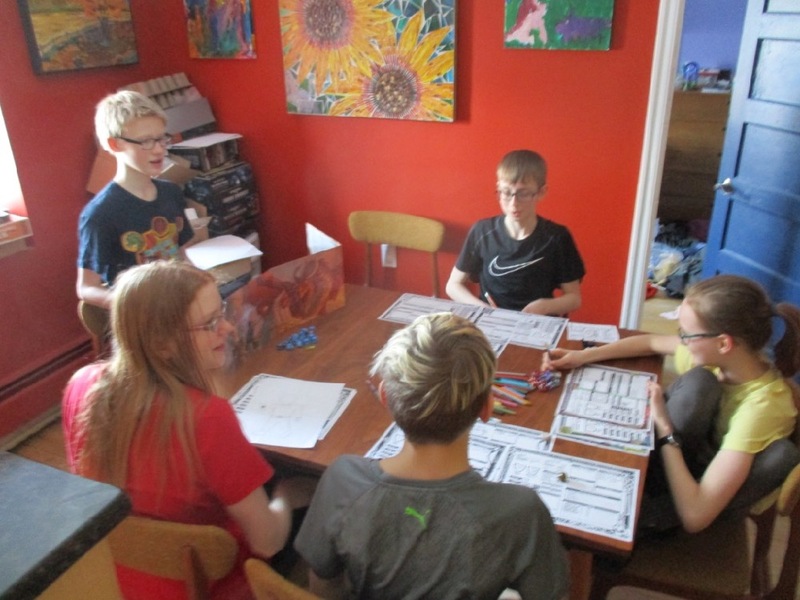 On Monday, they continued the Dungeon Crawl Classics campaign that Finnegan has been running for a few sessions now. 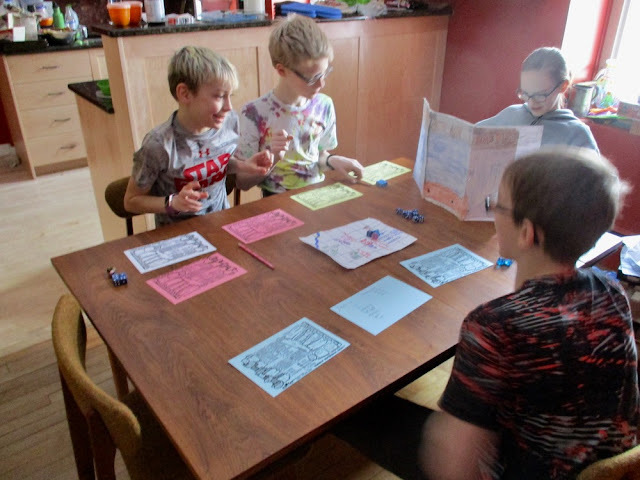 Day Two of the School Break Gaming Week – continuing with their Dungeon Crawl Classics campaign – I noticed Finnegan was running the old Against the Cult of the Reptile Gods D&D module. Later, after the Boyz left, the kids played a game of Mysterium! (Finished off Legion Season Two… in the end, I don't think I liked it as much as Season One... I still liked it, though). 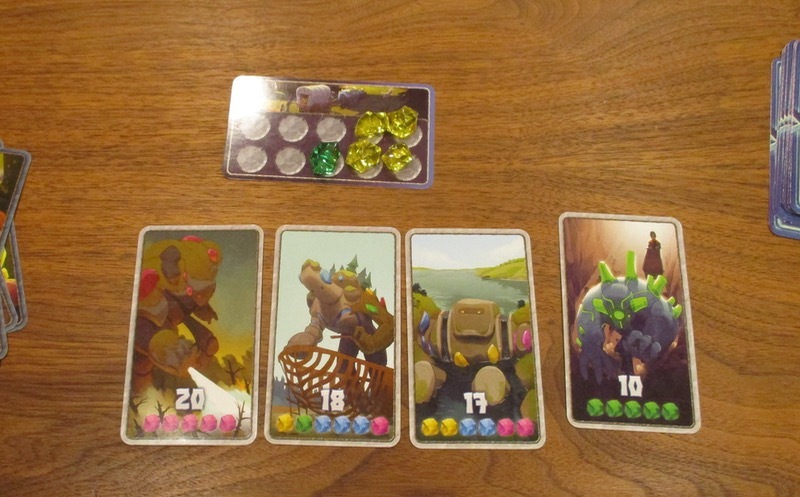 Friday was Family games night again, so we busted out Century: Golem Edtion. At one point I had EIGHT Pink Gems (the most expensive) on my caravan! Finnegan ended the game taking a fifth card... but I won, because my four were worth more overall! Amanda and I started watching West World Season Two. 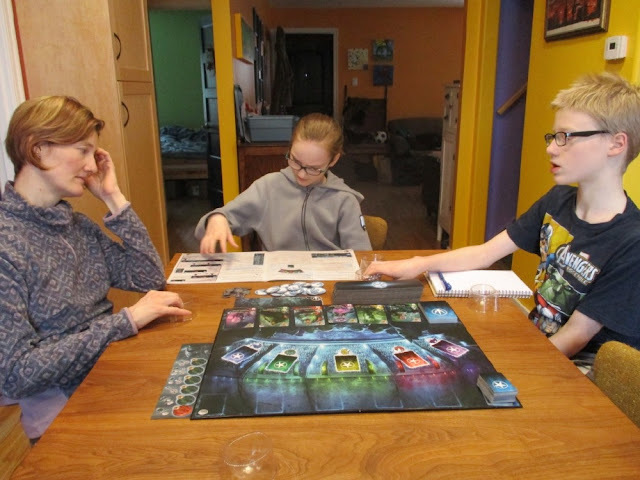 Despite Sunday being our OTHER Family Game night – we skipped it this week to finish off West World Season Two (because I had to take it back to the library on Tuesday). 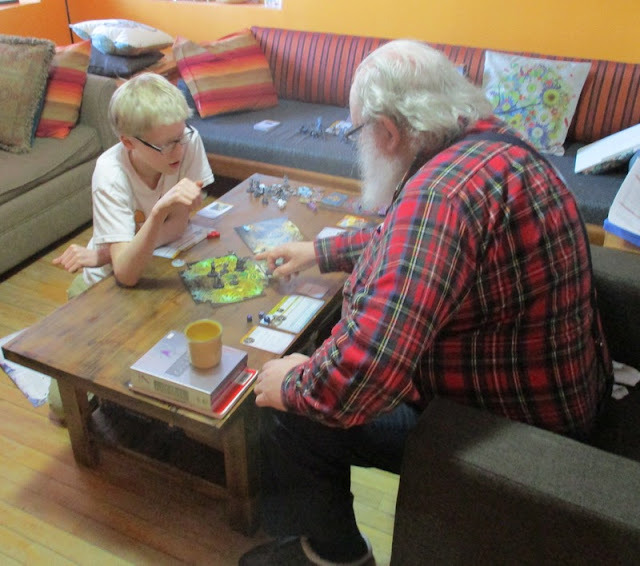 In the afternoon my folks came over and did stuff with the kids – My mom did some baking with The Girl and my Dad played Warhammer Quest: Silver Tower with Finnegan. And.. that's it for February! 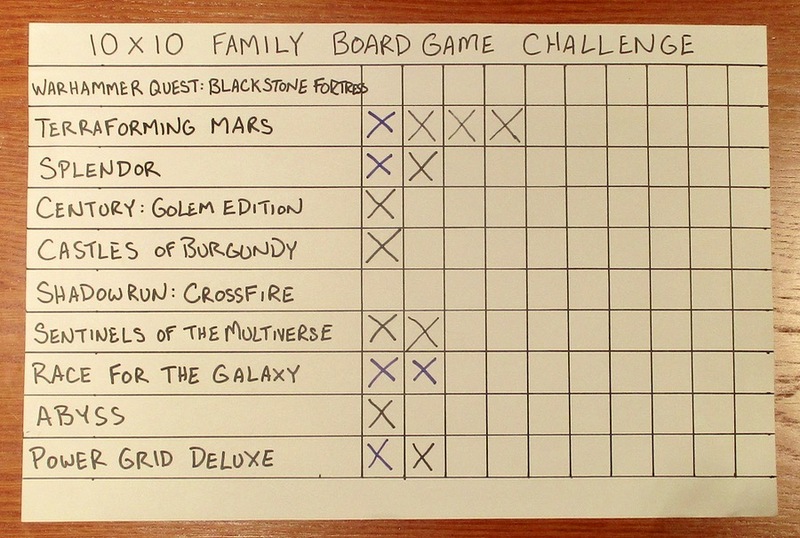 It seems like we’re keeping up with our 10x10 Family Boardgame Challenge. At two months in, playing two games a week, we should be around 16... and we're at 15 games played (of course two games a week for the year would be 104... so... I guess we're probably right on target). 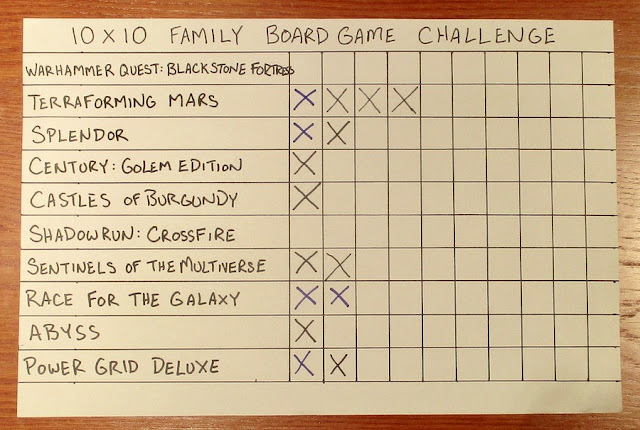 I’m… doing not quite as awesome with my 10x Personal Challenge, but I was busy preparing for the Game Weekend, and I expect things will pick up this next month – already planning out my weekends to fit in some board and miniature gaming! 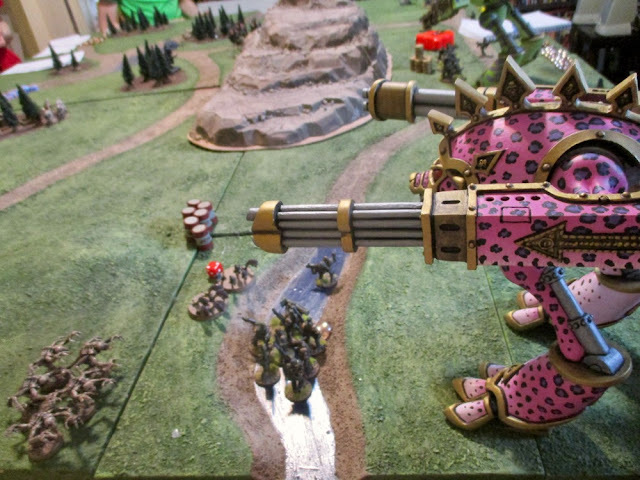 Heck, I’ll be getting in THREE games of 40K this weekend! I am hoping to get in a Dan Mercy Game, a Phil Eklund Game and one of the GMT/COIN games in on each of the remaining weekends of the month. Probably a report of the Battle of the Abyss – the Apocalypse event I will be attending with my THREE TITANS(!) this Saturday (2 March 2019)! I suppose I should get working on the Blackstone Fortress stuff first - so we can get playing that!! There are the Rogue Trader minis too.. So many other things I'd like to paint - my craft world Eldar and harlequins... my Tallarn (still LOTS of those to do)... the Valhallans.... other Kill Teams and assorted 40K figures... forces for Rebels and Patriots and The Pikeman's Lament and even Dragon Rampant and Frostgrave that I'd like to finish up! For the last few weeks the 222nd Guaiacan Commando Regiment has been heavily engaged against a massive force of Tyranids. It started when scores of pods started making planetfall. Sergeant Hammer's Team was on a long range reconnaissance patrol at the time and was able to locate half a dozen of the pods, vox in the coordinates and watch them burn as they were bombarded with orbital lance batteries. So many more escaped the orbital bombardments, though. So large were the forces, both in number and physical size, that aid had to be requested from the neighbouring forge world of Xoxigar Secondus - in the form of two Warhound Scout Titans! The Scout titans eliminated the threat from the Hierophant Bio-Titan, but Elements of D Squadron, #4 Commando were overrun and the battle ultimately lost. Survivors of the engagement retreated back to their local firebase and have been under siege ever since. 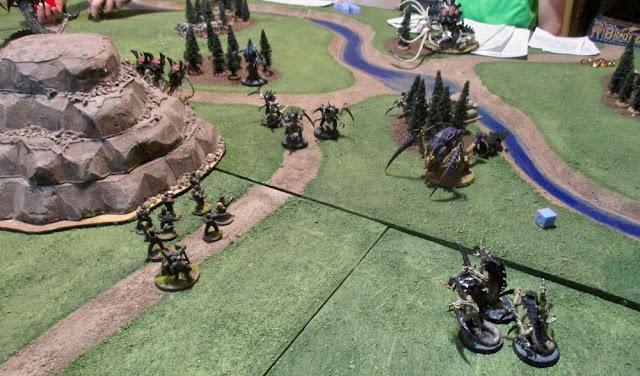 While still out in the field, Sergeant Hammer's team found themselves being surrounded by swarms of the Tyranids. When he requested an extraction, he was told there were no units available to pull him out, and even if there were, the area was too saturated with the enemy to safely do so anyway. His team was ordered to try and make it back to their squadron's firebase to aid in it's defence, as an imminent attack was expected. 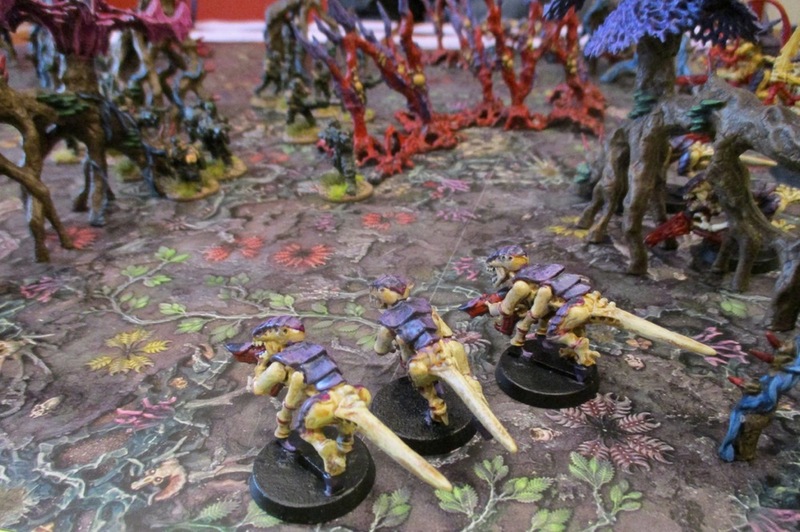 Hammer's team stealthily picked their way through the jungles of Xoxigar Tertium - constantly surrounded by the infesting xenos - leaving boobytraps along trails that the Tyrniads might travel along. Eventually it came to a point where they realized they were going to have to fight their way through some of the Tyranids to get back to the base before it was overrun. It's been a while since I got in a game of Kill Team. I think it was actually last year when I last played. So it was great fun to get out the toys and throw down with Bruce this afternoon! 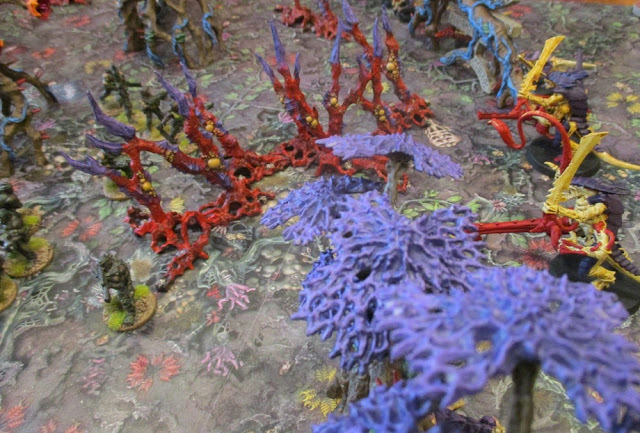 The troops of 2 Section, 3 Troop, A Squadron, #2 Commando, 222nd Guaiacan Commando Regiment seized the initiative and surged forward, looking for a gap in the swarm of Tyranids before them! I tired to get as many of my troops as close to the exit edge as possible - fully expecting all the Tyrannids to charge into melee... because... that's what they do, right? Ah, except Bruce had completely switched up his Kill Team and had a PILE of shooty Termagants!! And shoot the Commandoes they did! A storm of goo and small larvae that bored into flesh on contact spattered the leading troops! Pte. Dave, Pte. "Blazer" Johnson, and Pte Farnsworth all went down, and Pte. 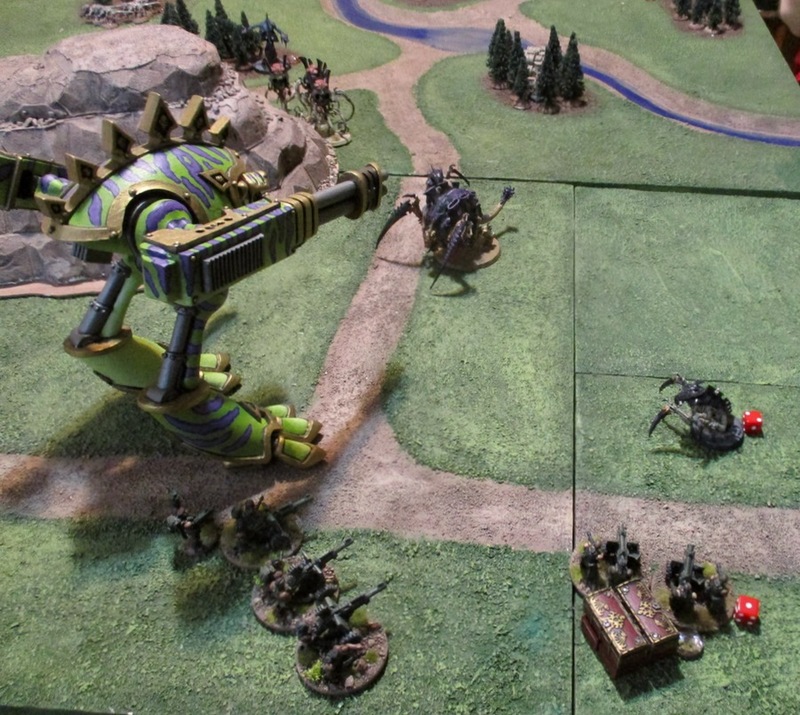 Loiselle was injured - the flamer and the meltagunner out of action and the grenadier wounded... it's almost like those creepy bugs knew what they were doing?! Lasguns flashed back through the dense cover, but only one of the enemy was wounded - one of the Termagants with a flesh borer was lightly wounded by Pte. Hawkins. Once again the Guard seized the initiative and surged forward again - they weren't going to clear this Kill Zone by sitting on their duffs! and that's where I stopped taking pictures. 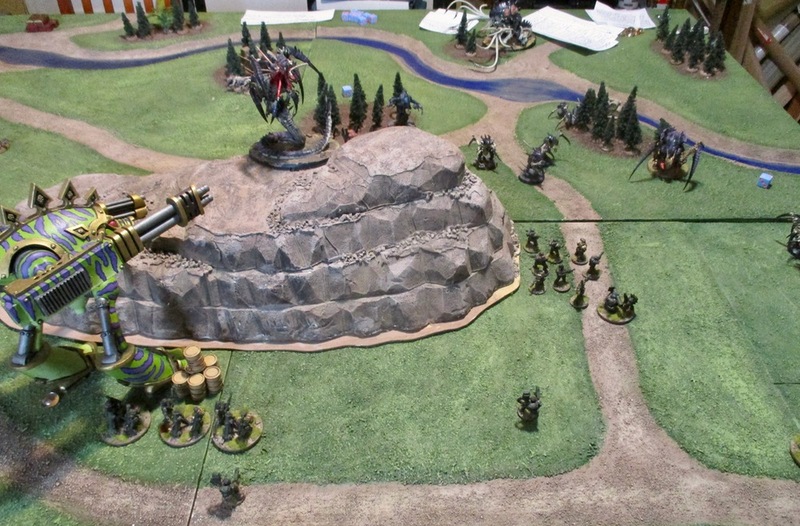 Also during round two Spikey the Tyranid warrior fired it's deathspitter at Pte. Loiselle and wounded her a second time, taking her out of action. The Tyranids won the initiative this time, but decided to sit still and shoot, if able, expecting I'd charge them... the only ones that charged were Sgt. Hammer and two others adjacent to the ongoing Melee with the Tyranid Warrior. Bruce had used a stratagem that prevented those that were already in close combat from falling back this round, so Sarge though he best get in there and help them. Pte. 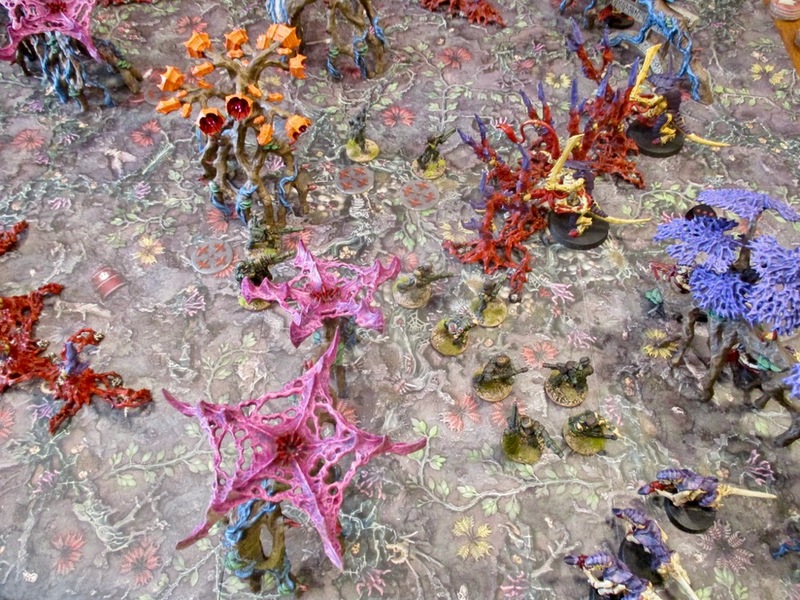 Morse snuck through a stand of Venomgorse and was on her way to making it out of the kill zone when she was struck down by a splatter of acidic ichor. 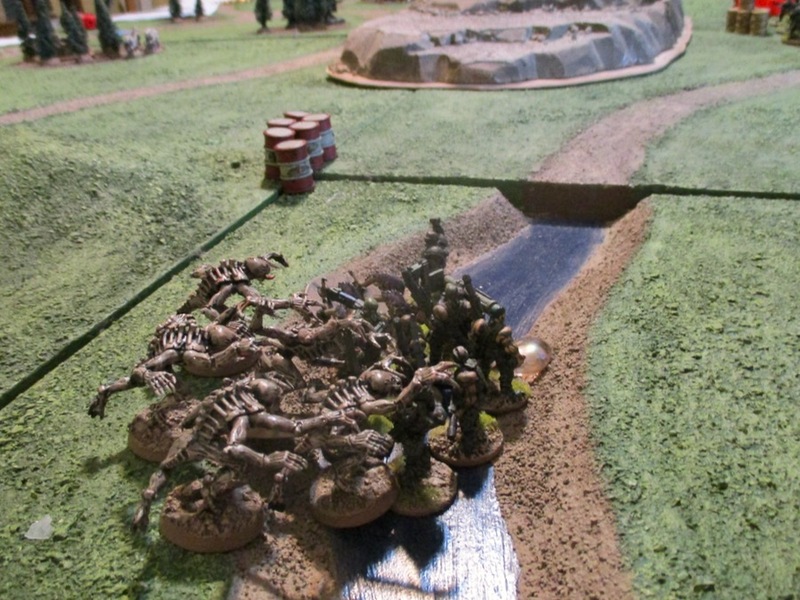 Pte Oswald, the sniper, was also taken out of action by fire and, with half of my force out of action, that ended my chances of winning this game..
We finished off the melee phase and the Pte. 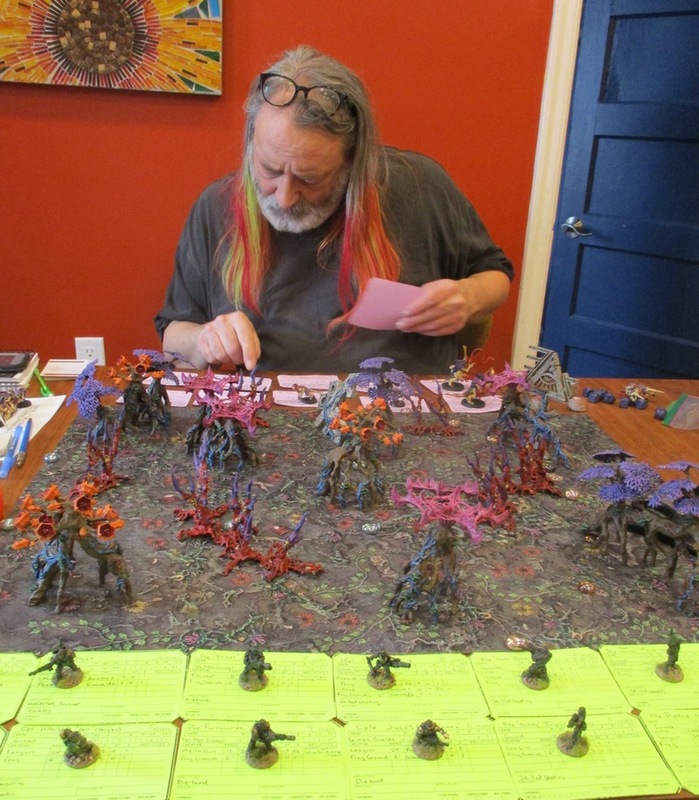 "Bobby" Taylor took down the Tyranid Warrior, knocking off it's final wound - but the group was showered in caustic blood which knocked Pte Hawkins out of action! 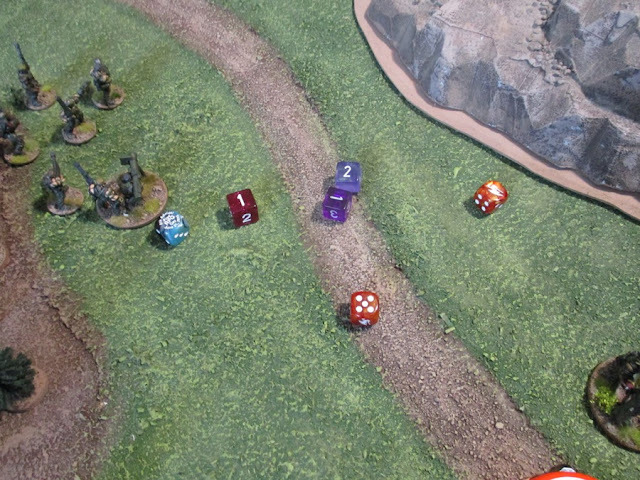 With half his troops down, it was clear to Sergeant hammer that they were not getting through this way and called for a retreat. The Team dispersed and disappeared into the jungle. They were able to regroup some time later and tend to their wounded and get their bearings and try to find another way back to their firebase. For losing the game I lost 1 Intelligence and 1 Territory resources. The A Squadron firebase was overrun by the xenos horde and the team would have to push on through the jungle - taking a rather circuitous route to try and rendezvous with the survivors at some point. The fleet stands ready at Xoxigar Secondus. The call of the Warmaster has been heard. The enemy has chosen to make it's stand on Malice. The situation is in extremis. 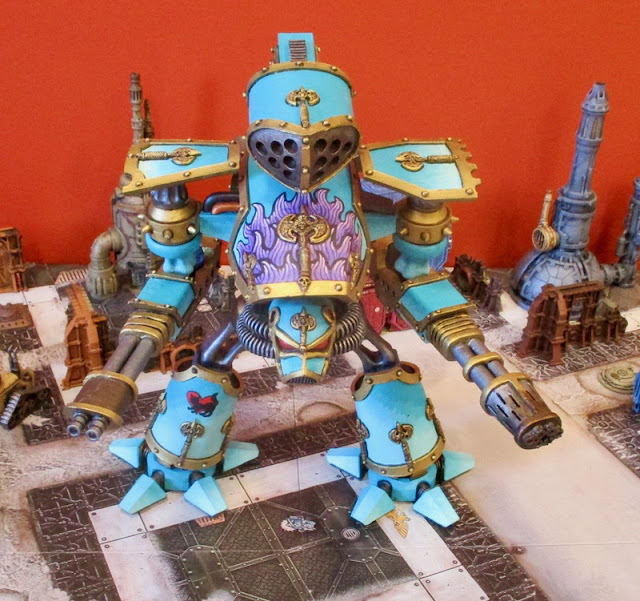 I've finished up Leonem Caeruleum - my Reaver Battle Titan - with less than a week to go before the Battle of the Apocalypse - Armageddon Event! 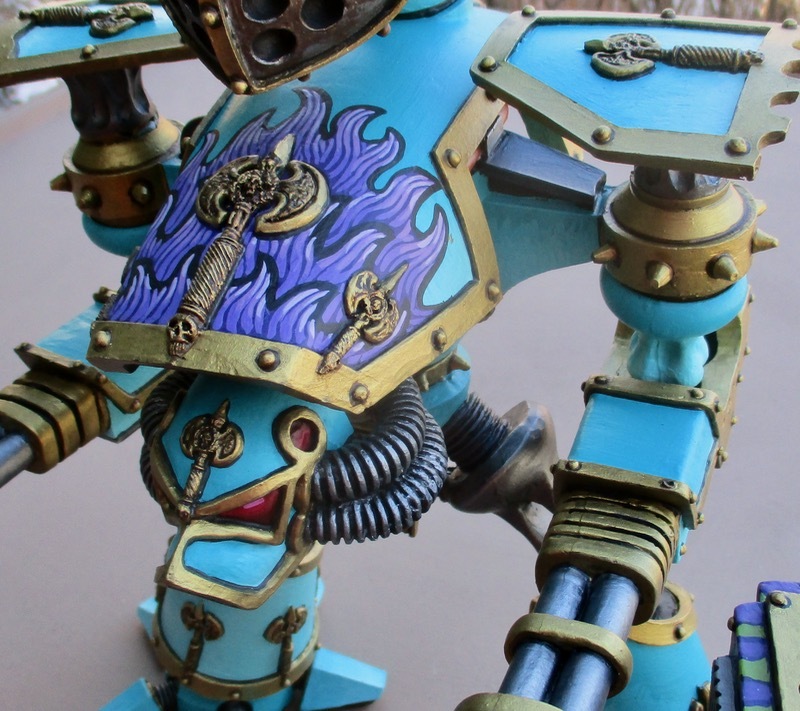 The model is an old Armourcast Reaver Titan. 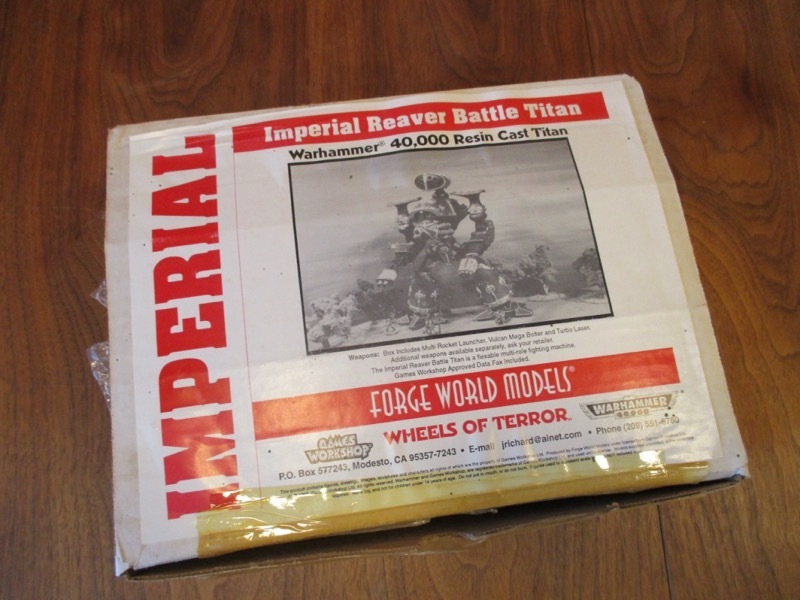 Though, from the packaging, this one actually says it was made by Forge World? Perhaps when Forge World started up they took over all the old Armourcast moulds...? Sticking with the "Cat" theme I tried to make this one look a little like a Lion - with a stylized mane on the carapace. Leonem Caeruleum joins it's mates in the Eritque Arcus Maniple; Tigris Viridi and Pardus Purpura. 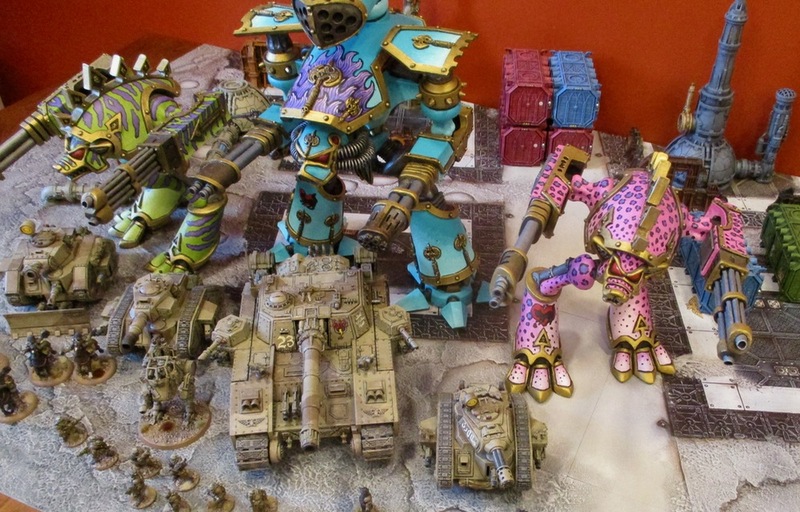 With a Shadowsword Super Heavy Tank, three Leman Russ tanks, a Sentinel, five roughriders, and a pile of infantry for scale. 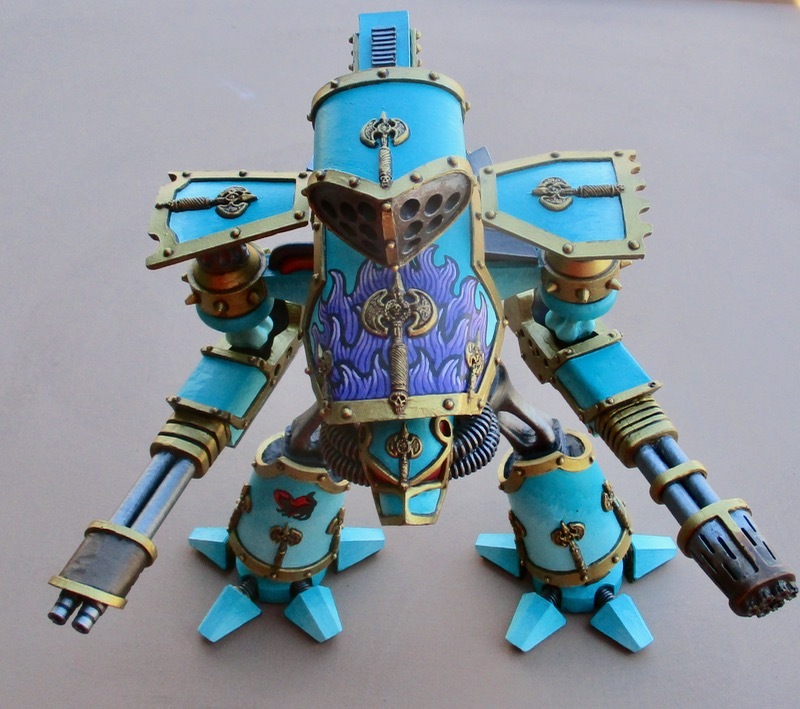 The Eritque Arcus Maniple is all that remains of the once mighty Legio Amare Feles - stationed on the Forge World Xoxigar Secondus. Leonem Caeruleum is crewed by First Princeps Ilyan Curtis and two Moderati; Moderati Petrus Hook (Steersman) and Moderati Bernhardt Sumner (Sensors, Communications, Weapons) and two Tech Priests Mor-15 and Gi-16-ERT. 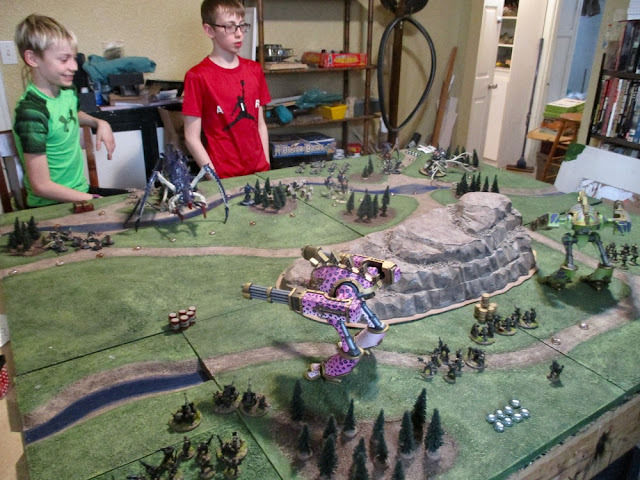 Total: 270 Power Level/8000 points, +1 Command Point. 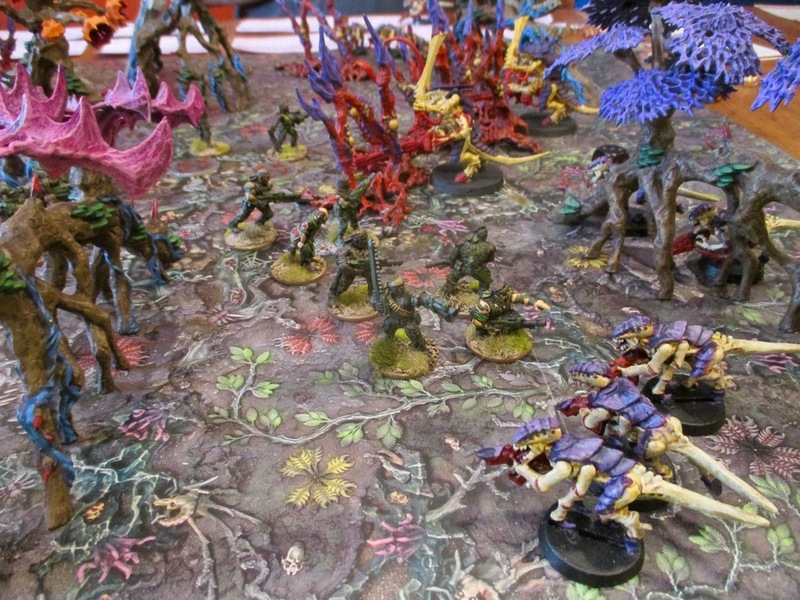 I'll probably have a round-up of the games we've played over the month later this week, followed by a report of the Battle of the Abyss: 40K Apocalypse Event later on the weekend. 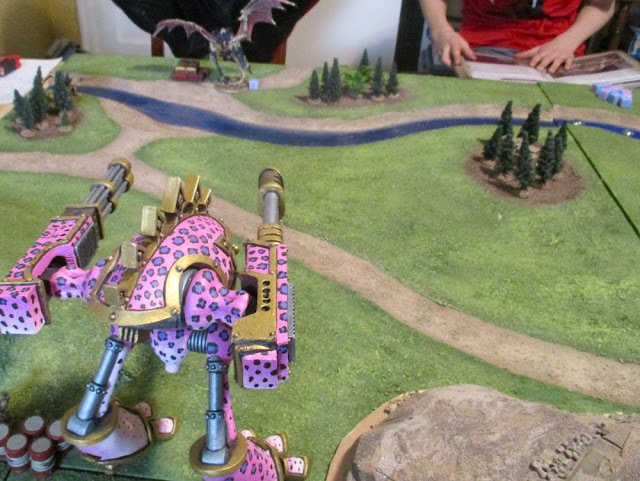 A significant force of Tyranids has been detected on Xoxigar Tertius (suspected to be from Hivefleet Haemorrhoid) - including a Hierphant Bio-Titan. 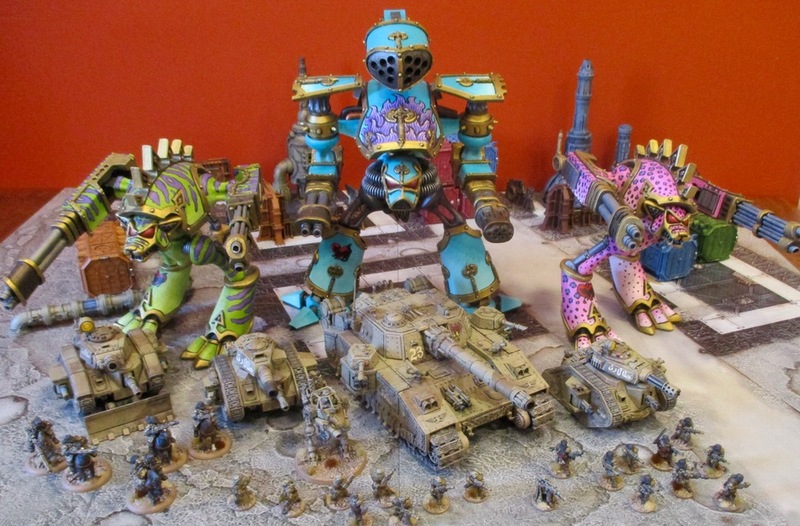 The two Warhound Scout Titans of Eritque Arcus Maniple of Legio Amare Feles - stationed on the nearby Forgeworld of Xoxigar Secondus - were summoned to destroy with the Bio-Titan and support the 222nd Guaiacan Commando Regiment in dealing with the growing Tyranid menace! 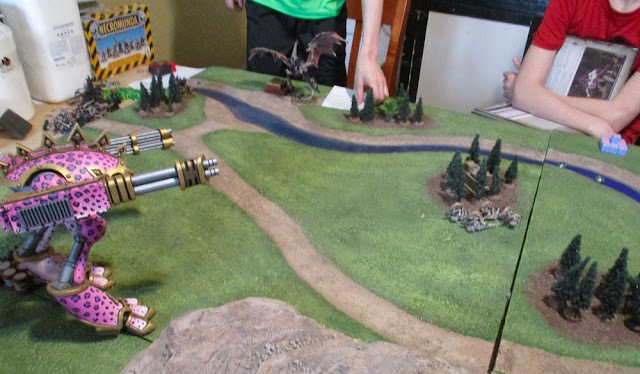 We played a scenario that Ill be playing next week at the Battle of the Abyss Apocalypse event - there were six objective markers scattered across the table, victory points were gained for holding them at the end of your turn (+2VP) or taking out a unit that held one at the end of their previous turn (+1VP) and the usual stuff (First Blood, Killing Warlord, etc). The game is played in four rounds or three hours - whichever comes first. All set up and ready to ROCK!! But Pardus Purpura's Turbo-laser only did 12 wounds!? 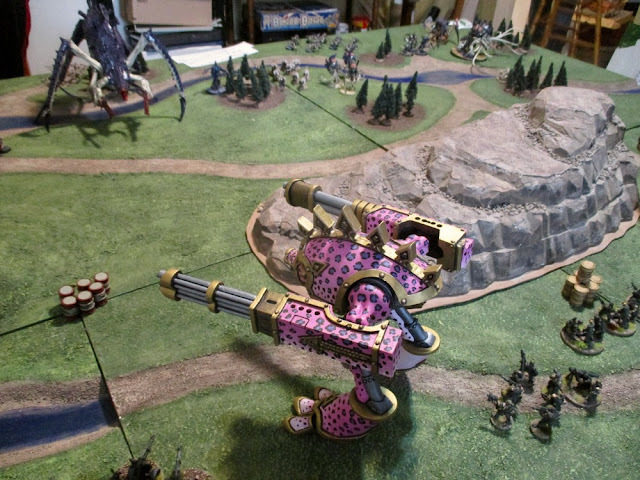 So The Girl unleashed it's Titan Mega-Bolter on it as well and shaved off another 8 wounds... leaving it with TWO!! 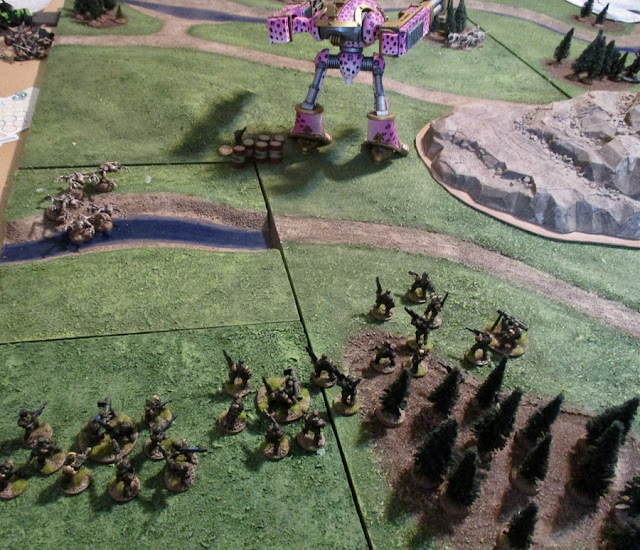 On the Tyranids first turn the bugs all skittered forward. 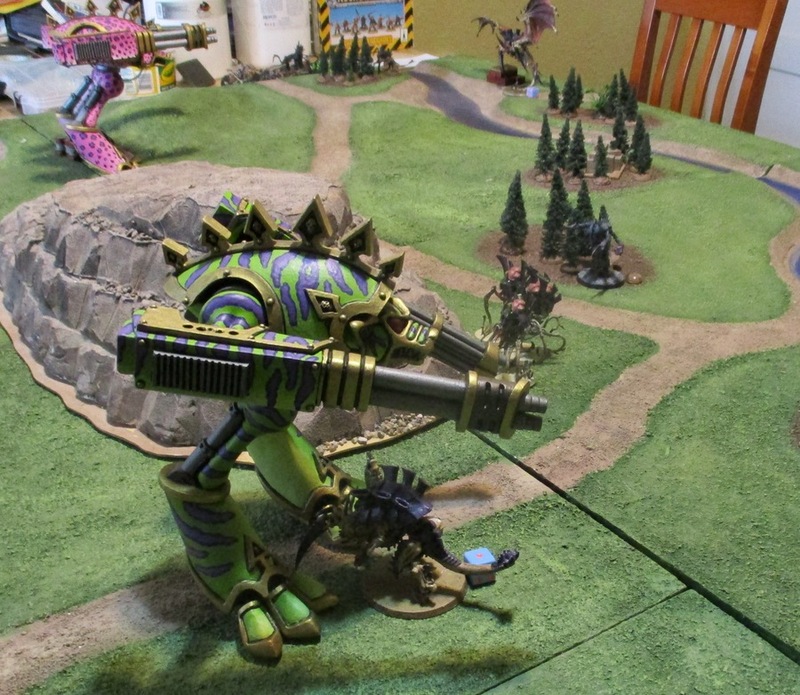 The Bio-Titan unleashed it's Dire Bio-Cannon at one of the WArhound Titans: three wounds, two saved, re-rolled the other and saved it as well... aaaaand that's all it did this game. 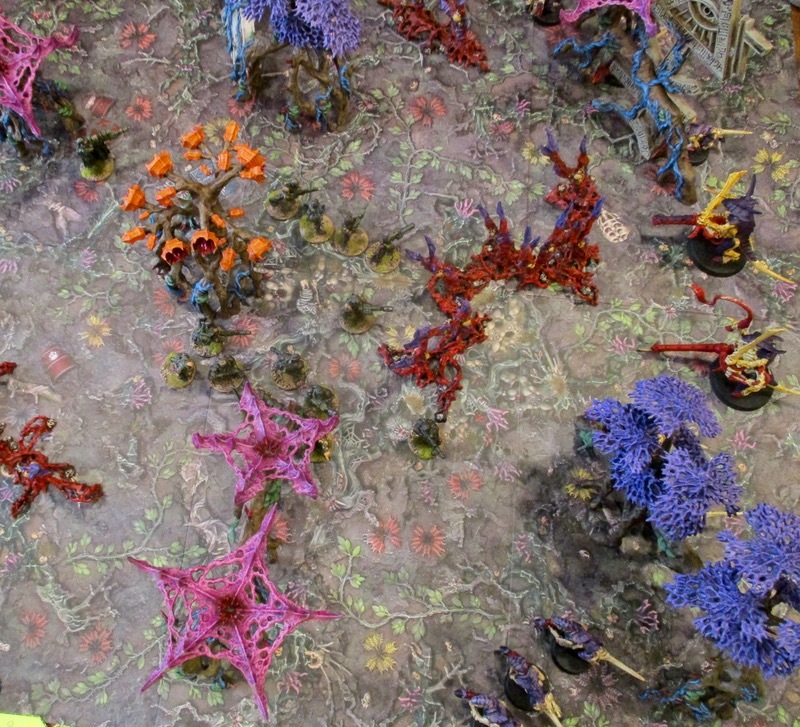 +6VP for the Tyranids for Objective held at the end of the round. Pardus Purpura blasted the Toxicream into a vicious puddle of black ichor. 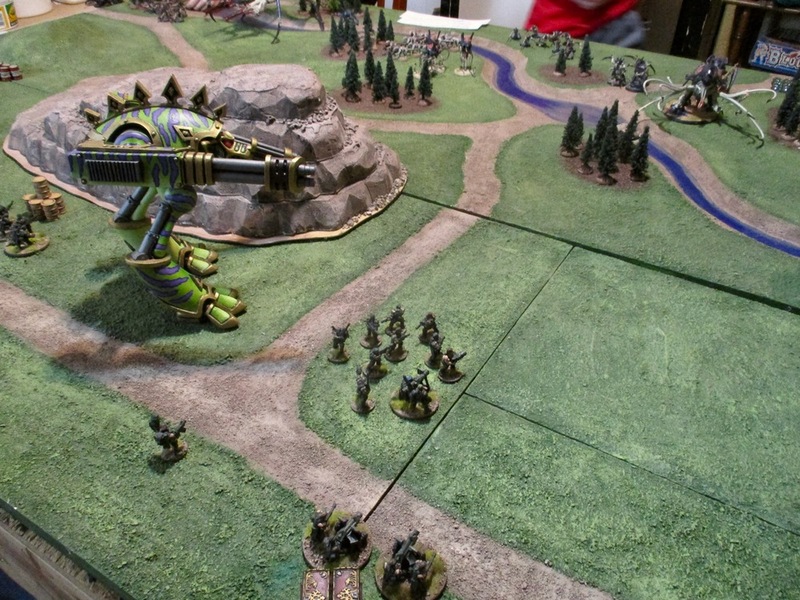 Elsewhere one squad of Guardsmen actually KOed SEVEN Hormagaunts - with some of the best shooting the guard has EVER done! The Mortars took out three termagaunts. The Autocannon Heavy Weapon Squad took out 3 termagaunts. They spend two command points to bring the Toxicream back on using the "meat grinder" stratagem. The bugs surged forward again! 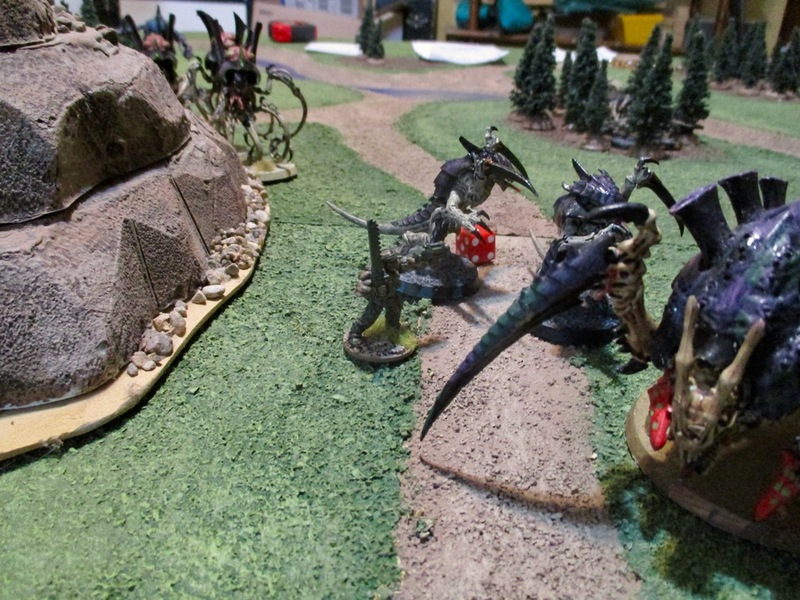 They also brought on the Ravenors, Rippers, the Harpy, The Molock, and the Flyrant. The Flyrant wiped out the Heavy Weapon Squad armed with Autocannons, while the Ripper Swarms took out two guard. The Guard, fighting back, took out a stand of the Rippers. Tigris Viridi and the Guard section withdrew from their respective melees. The Heavy Bolters KOed one of the Ravenors... then another ran away due to failed morale! 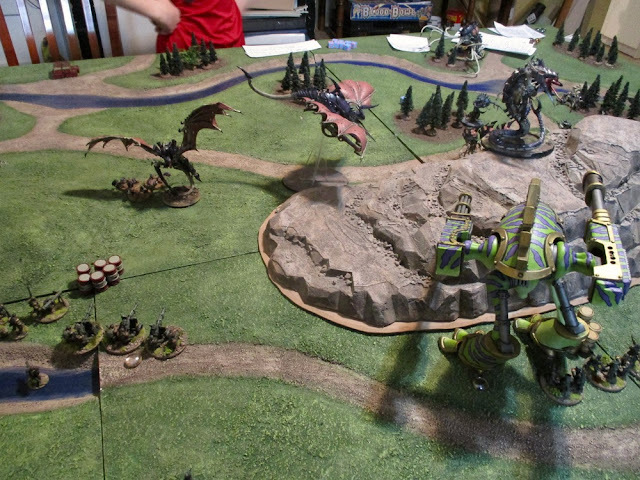 Another two command points spent to bring back the Flyrant. Bugs move up in preparation for MORE Melee action. They overran the Guard infantry Squad - but the Company Commander survived and took out the remaining Rippers. Except Sergeant Duncan - who finished off a Tyranid Warrior before ducking into cover and making his way back to friendly lines (failed morale and left the table....). I used two command points to make use of the meat grinder stratagem and brought back two infantry squads and a heavy weapons squad! 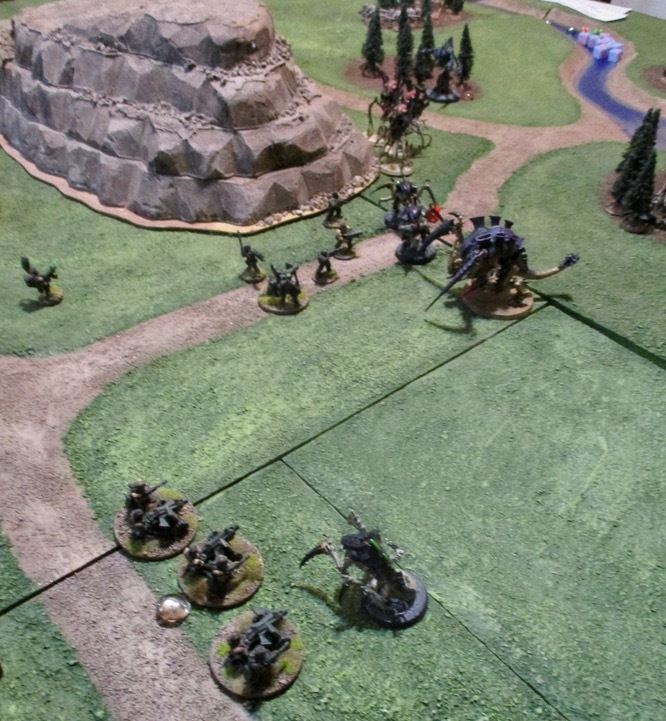 Tigris Viridi shifted back to the right flank where things seemed like they were coming apart. 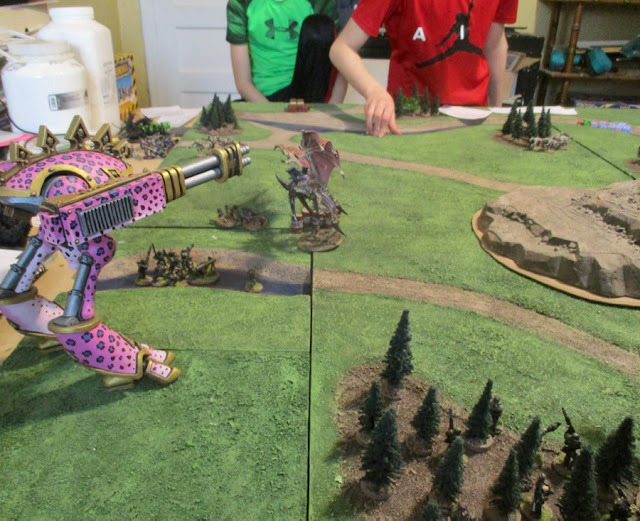 The Heavy Bolter Teams fell back away from the Ravenor so the newly arrived Autocannons could blow it away... they only managed to do one wound to it!? Pardus Purpura surged forward! The Tyranids were now ahead on points and I was feeling like perhaps I hadn't been aggressive enough with the Titans. 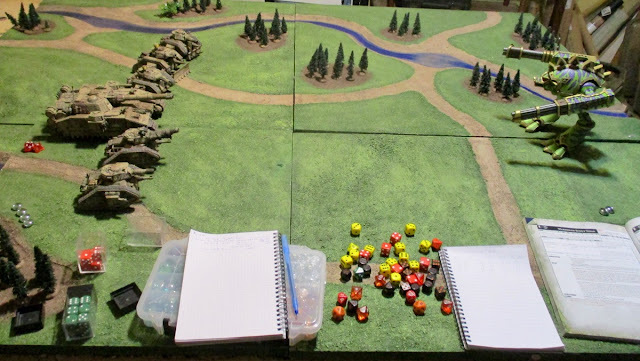 There was no way I was going to make it TO any of the enemy held objectives, but two of them were held by relatively small forces of Termagaunts/Hormagaunts and I could certainly blow some of them off the objectives and score a couple extra points THAT way! 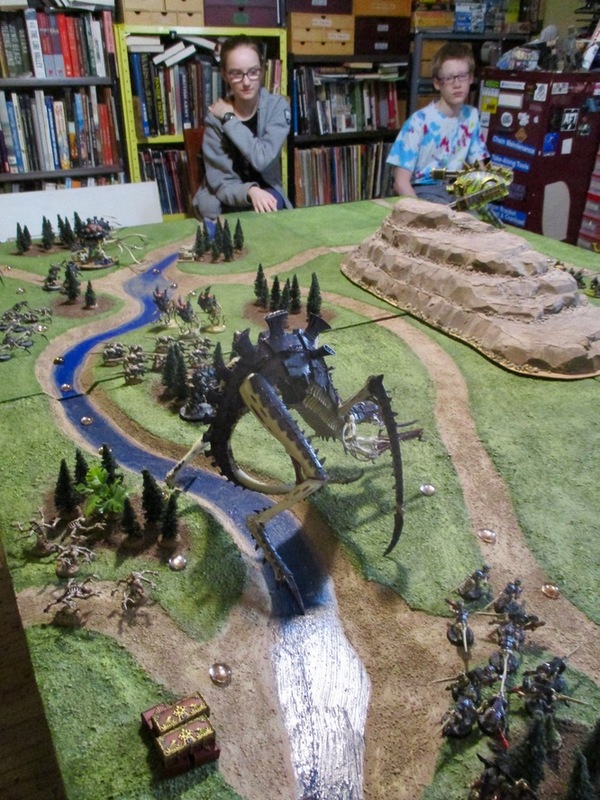 The Dragon and the Free RPG Day logo are ones... that's 11 damage... on a roll that should, on average, have done double that... ONE SHORT of taking out the Flyrant!!? (which would have gotten us another Victory point as it was the only one holding that rear objective!). Three full squads blasted away at the Genestealers... but somehow two managed to survive - I've never seen so many fives rolled in a row for saves!? They shifted some units about to retake objectives. 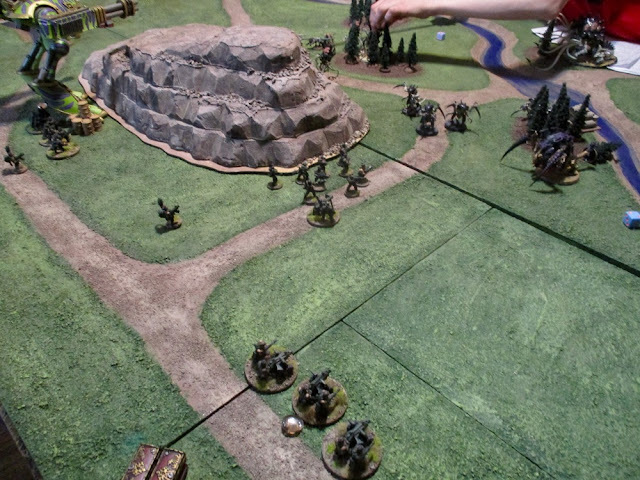 The last Ravenor charged the heavy bolder teams and wiped them out! 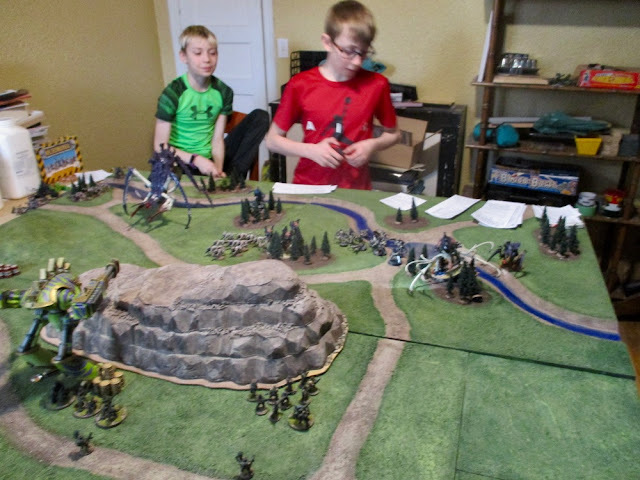 So fun to finally get the titans on the table!! Finished the four turns in just under three hours... I think...? Maybe it was just over three hours...? Started around 10 am... finished... 1-ish? My total losses were two squads of Guard Infantry, and two Heavy Weapon Squads. 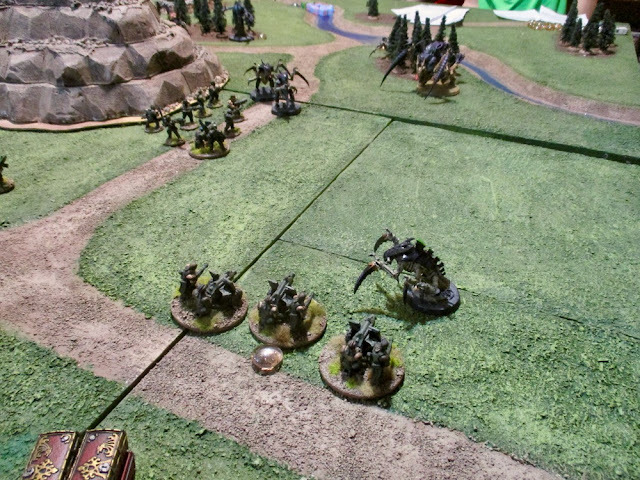 I Probably should have charged forward quicker with the Guard - one unit sat in the rear until the last turn. Part of the reason they sat back was to prevent deep-striking earlier... after that it didn't seem like they'd have enough time to get forward to contest any objectives - even if they could get past the wall-o-bugs... Perhaps I could have been a bit more aggressive with the Titans as well. Painting updates... probably some assorted 40K or Necromunda minis... then the Reaver Titan... before that I'll probably have a round-up of all the boardgames we played in February. 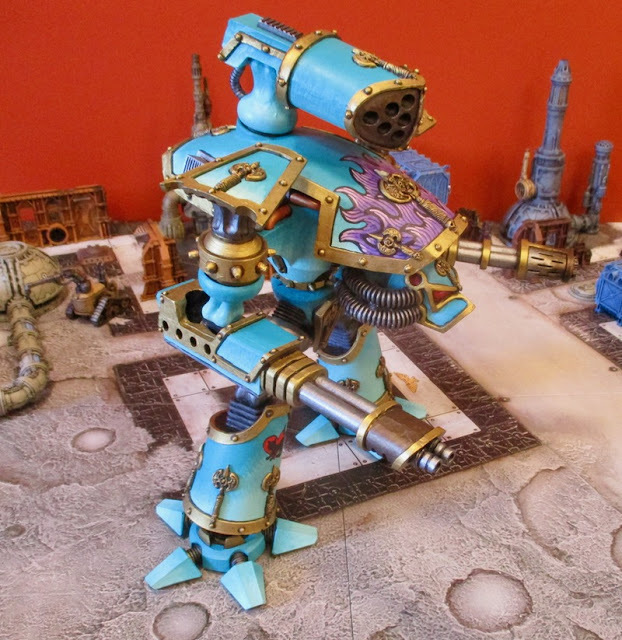 I'm hoping I might get in a game of 40K or Kill Team with Finnegan over the weekend.